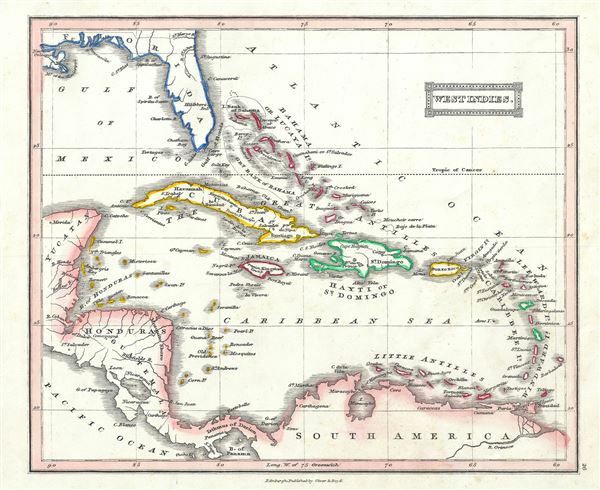 This is a lovely example of Thomas Ewing's 1845 map of West Indies. Centered on Haiti or Santo Domingo, it covers the Caribbean from Florida to the Bay of Panama and from Yucatan to the Lesser Antilles and Barbados. It includes the Bahamans, Cuba, Jamaica, Haiti and San Domingo (Hispaniola), Porto Rico, the Virgin Islands, the Leeward and Windward Islands and Trinidad and Tobago. It also shows Guatemala and the Isthmus of Panama. Various towns, cities, rivers, mountains, islands and several other topographical details are noted with relief shown by hachure. Undersea features including the Great Bank of Bahama are also noted. This map was published in 1845 by Oliver and Boyd as part of Ewing's New General Atlas.